How I Make My Hormone-Balancing Smoothies For Menopause Symptom RELIEF! Plus my two favorite tips for making any smoothie more menopause friendly. 4:30 Tips for serving your smoothie that make it easier to digest! Learn more about hormone balancing smoothies and other natural remedies for menopause.. Check out THIS ARTICLE for my smoothie building chart and some other favorite natural remedies for menopause. So what's the recipe for these hormone balancing smoothies for menopause?? Sweetener: Optional! But if you like it more sweet add 5 drops of stevia, a squirt of sweetfruit drops, a date, or 1T maple syrup. Put all ingredients in a powerful blender - and blend well. Hi I’m currently experiencing the joys of Peri menopause. Nit had a period since Oct 2017. I’ve experienced every possible symptom ( but I’m sure there are plenty I’ve yet to be introduced to on my menopausal journey) . I cannot take her as have had breast cancer. Dr won’t do blood test to check fsh levels, as I’ve been told it’s a water of time. I’m currently taking evening primrose oil vit d glucosamine. I was taking magnesium hut have stopped as the muscle twitch symptoms have subsided. I’ve been told I cannot take black cohosh or St John’s wart….my latest symptoms are a jaw, neck and head ache, pain resinates into my ear and gives me tinnitus. I also experience what I can only describe as brain rushes….can you help at all..
Hi Melanie – Because of your history of cancer you want to be careful – but there is still LOTS you can do to help your body balance hormones including building healthy hormones levels like progesterone and making sure your body is able to detoxify aggressive forms of estrogen. The first thing to do is get your diet into just the right place to support your hormones. 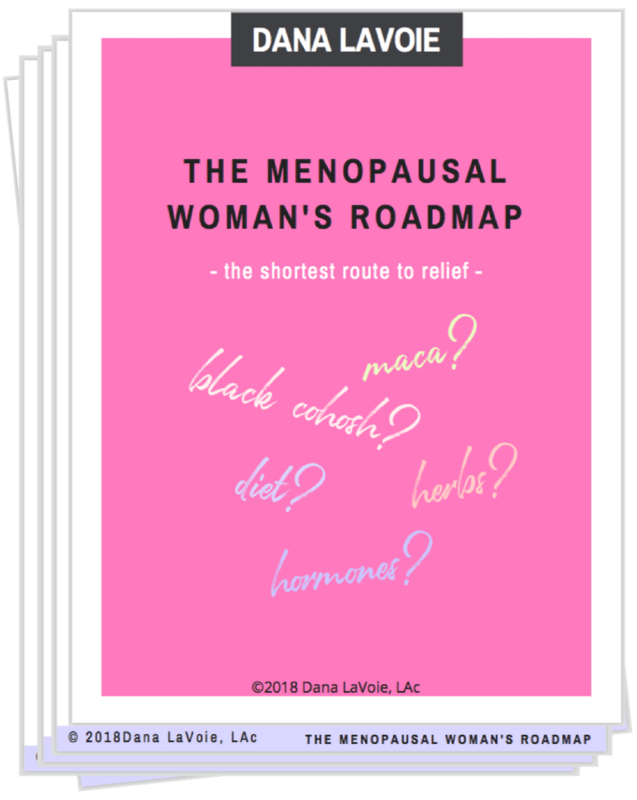 Once you have that in place you may find its enough to get wonderful relief:) I suggest downloading my Menopausal Woman’s Roadmap – it will get you started on just the right diet (and if you like it – along with the roadmap you’ll get an invite to an hour-long free class that I teach on the same topic!! So look out for that.) You can download your roadmap right here – and it’s free. https://danalavoielac.com/roadmap-1/ There are also herbs and supplements you can use safely – but with your history – i ONLY recommend even considering them AFTER the diet is in place AND only if you work with a qualified herbalist or practitioner 1:1 for customized recommendations!